We took a 2am flight into Male from Dubai. Just 3.5 hours, we slept most of the way and landed in the morning. From the airport -which is right next to the ocean, we got on a speedboat at which point we were asked to take off our shoes - no news, no shoes. 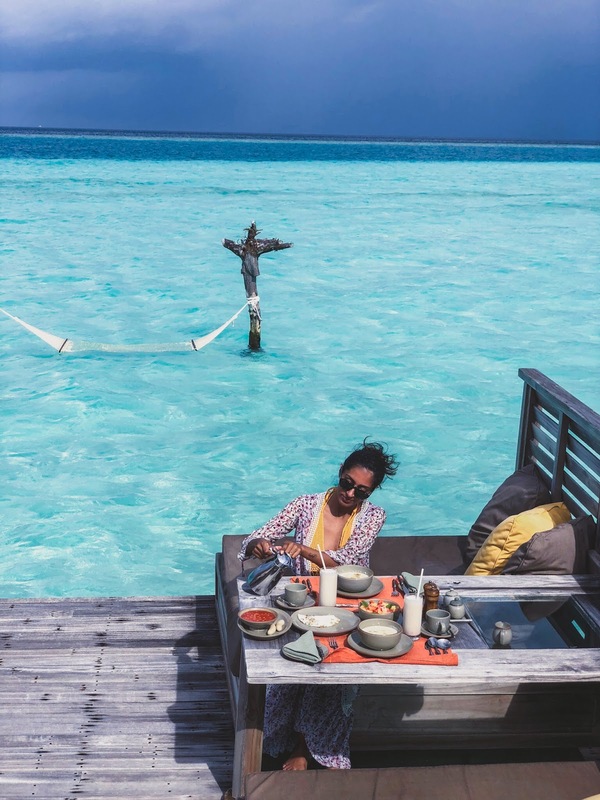 As we approached the island, the first thing we saw were the beautiful overwater villas on top of stunning turquoise water. Upon arrival we were greeted warmly by the resort manager, some of the staff and Mr. Friday. Taken from Robinson Cruse, Mr. (or Ms.) Friday has been trademarked by Gili Lankanfushi for their butlers. Every guest gets their own Mr. or Ms. Friday available 24/7. Each of them welcoming us as if we were visiting family. We were then escorted onto another boat and taken to our villa, Crusoe 2. A detached 1 bedroom villa which is only accessible by boat from the main island, going with the eco-friendly theme of the resort it's made of bamboo and wood. Entering the villa, we stepped into a spacious living room behind which was a beautiful balcony with 2 hammocks, sun loungers and day beds. To the left of the living room the villa featured a small kitchen and mini bar and a cozy bedroom with windows all around. To the right of the living room was a large bathroom, outdoor shower, and access to a private lagoon. I mean - wow. And I haven't even mentioned that the balcony leads to the ocean and a private hammock. We could also take the stairs up to the roof which had another day bed and gorgeous views of the resort. Walking through the villa to the gorgeous balcony, we could jump into the sea and go on our own private hammock. The main island of the resort had restaurants, an over water bar, pool and gym. Each villa also had special bamboo bikes for visitors to use. If you had a villa connected with a bridge to the main island, you were able to ride your bike directly from the main island to your villa. The larger over water villas however, were only accessible by boat. The concept of no news, no shoes encourages you to leave your shoes and the news behind to be at one with nature and enjoy the experience. The entire resort is committed to reducing the impact on the environment, reuse and recycle wherever possible and grow their own organic vegetables using the recycled waste. It's no surprise that this pristine resort won the 2016 Trip Advisor Travelers' Choice Award for number 1 luxury hotel in Asia, and number 2 in the world! I can't say enough amazing things about Gili Lankanfushi. The only downfall was the weather (which, of course, is unpredictable). Due to the cyclone in Sri Lanka, the weather in the Maldives was very windy with on and off rain for 2 days. But the last day we were there was amazing. We spent time at the beach, cycling around the island, and then of course enjoying time in our gorgeous villa.